Niccolò di Bernardo dei Machiavelli (3 May 1469 – 21 June 1527) was an Italian diplomat, politician, historian, philosopher, humanist, writer, playwright and poet of the Renaissance period. He has often been called the father of modern political science. For many years he was a senior official in the Florentine Republic, with responsibilities in diplomatic and military affairs. He also wrote comedies, carnival songs, and poetry. His personal correspondence is renowned by Italian scholars. He was secretary to the Second Chancery of the Republic of Florence from 1498 to 1512, when the Medici were out of power. He wrote his best-known work The Prince (Il Principe) in 1513, having been exiled from city affairs. Machiavellianism is widely used as a negative term to characterize unscrupulous politicians of the sort Machiavelli described most famously in The Prince. Machiavelli described immoral behavior, such as dishonesty and the killing of innocents, as being normal and effective in politics. He even seemed to encourage it in some situations. The book gained notoriety due to claims that it teaches "evil recommendations to tyrants to help them maintain their power". The term Machiavellian is often associated with political deceit, deviousness, and realpolitik. 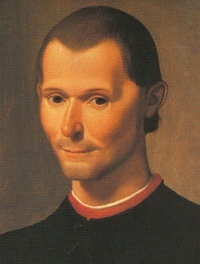 On the other hand, many commentators, such as Baruch Spinoza, Jean-Jacques Rousseau and Denis Diderot, have argued that Machiavelli was actually a republican, even when writing The Prince, and his writings were an inspiration to Enlightenment proponents of modern democratic political philosophy. In one place, for example, he noted his admiration for the selfless Roman dictator Cincinnatus. Unless indicated otherwise, the text in this article is either based on Wikipedia article "Niccolò Machiavelli" or another language Wikipedia page thereof used under the terms of the GNU Free Documentation License; or on original research by Jahsonic and friends. See Art and Popular Culture's copyright notice. This page was last modified 16:37, 9 February 2019. This page has been accessed 7,960 times.